We offer an extensive range of Rendering Equipment to our customers, from batch Cookers to Disc Dryers, we have a range of products that have a proven track record in the Rendering and Food Processing industries throughout Europe. Not only do we offer a wide range of products, we can also work to your specific needs. Our products can be designed and manufactured to your specific requirements. Our driers, pressure vessels and heat exchangers are all designed, fabricated, inspected and certified to the European Pressure Equipment Directive. On top of this, we also offer site installation, preventative maintenance and expert project management to give you a complete end to end solution. We understand that every project has different goals, which is why our batch cookers can be designed and manufactured to suit particular needs. Typically the design will included a steam heated jacket and rotor, as well as having a shell designed for in service wear and tear. A shell lining with corrosion resistant stainless steel can also be provided to maximise life expectancy. The Wykes range of Crushers are designed for size reduction of complete carcasses in addition to any other streams from slaughterhouses. The Wykes DDSP (Duel Direction Single Pass) crusher range have a proven track record in reliable size reduction in a range of industries. We offer a comprehensive range of smooth high performance hydraulic piston pumps, designed to convey and meter difficult materials at rates of between 3 and 60 cubic meters per hour. Each piston pump is supplied with power packs, non-return valves and slide valves. The Wykes Disc Drier is a surface contact drier designed for continuous processing of a wide range of wet solid products encountered in the food, petfood and rendering industries. Wykes Driers are installed in many applications including meat and bonemeal, feathermeal, bloodmeal, brewers grain and also high moisture content sludges. The Wykes Disc Cooler is a continuous surface contact cooler for use on a wide variety of products. It operates on the principle of indirectly transferring the heat from the product into the cooling medium which flows through the discs, usually cooled or chilled water. The unique disc design incorporates a profiled rib which provides additional strength characteristics to the disc plates and eliminates the need for staybolts. A standardised design of Continuous Steriliser can be tailored to meet particular applications with throughputs up to 20 cu m/hour. The standardised design features a flighted shaft and steam heated jacket. Arrangements are provided for steam injection into the main vessel. 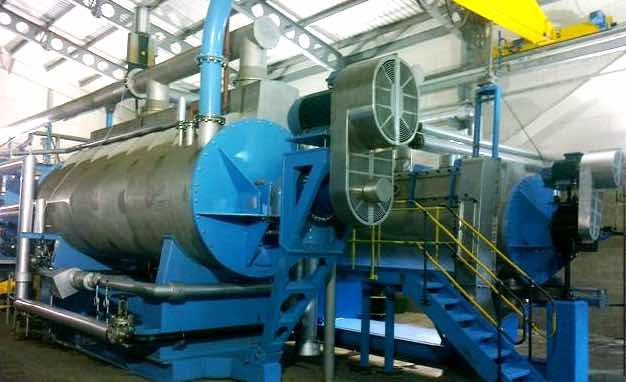 Wykes Thermal Oxidisers are specifically designed to eliminate noxious odours from gases and vapours and destroy the VOCs common in waste management, food processing, rendering and petfood production as well as traditional petrochemical industries. There is a comprehensive range of standard units covering the majority of requirements with bespoke designs available for specialised applications.